Locals and officials respond to Saturday morning's shooting at the Tree of Life synagogue in Pittsburgh. In a city known for its Jewish population, the neighborhood was the faith's spiritual heart and the synagogue a cornerstone of the community. For generations, Squirrel Hill has been known as one of Pittsburgh's most special enclaves, where the Tree of Life temple stood as a welcoming landmark. Residents marveled over their good fortune to live in a place that seemed open, accepting and secure. "People always felt safe here," said Jules Stein, a lifelong resident of Squirrel Hill who until recently belonged to Tree of Life. "In one day, that changed." A gunman opened fire Saturday at the synagogue, killing 11 people. It was the type of violence that seemed impossible to many who called the neighborhood home. Tanya Cohen, who emigrated from Russia and lives near Tree of Life, always knew anti-Semitism existed but never thought it would strike so close. "It seemed like here, those things were really far away and really removed from our reality," said Cohen, whose 12-year-old daughter was shaken by the sight of rifle-carrying men in fatigues passing by their home. "Those are the things that we read in on a newspaper or in a book or watch in a movie." The former leader of Tree of Life, Rabbi Alvin Berkun, was dressed and ready to head to the synagogue on Saturday when his wife asked him to stay home because she didn't feel well. He said the congregation only posted security officers on the High Holidays, but even so never felt unsafe there. "The community is very resilient and we will rebound," he said, "but it will leave a scar forever." Others, though grateful for the seeming bubble in which they lived, always feared such hatred could visit them. A 2017 report on Pittsburgh's Jewish community by Brandeis University researchers found 70 percent of area Jews were a little or somewhat concerned about anti-Semitism. Older Jews expressed the most fear: One-third of those 65 and older said they were very concerned, versus 10 percent of those 18 to 34. The report estimated about 50,000 Jews call Greater Pittsburgh home. About 1 in 6 respondents said they had directly experienced anti-Semitism in the preceding year, mostly involving comments, insults, jokes and stereotypes. One person quoted in the report said, while walking to a synagogue, a motorist yelled "dumb Jew" and spat at them, before warning them to "go back to Squirrel Hill." Another told of a campaign sign for Donald Trump being put in their yard with a note saying it was from their "neighborhood youth Hitler." "I have never been a person to say this could never happen here," said Aviva Lubowsky, a lifelong resident of Squirrel Hill who attended Hebrew school at Tree of Life as a child. "Ever since 9/11, sitting in synagogue for the High Holidays, I feel like we're sitting ducks." Ren Finkel, who moved to Pittsburgh from San Diego six years ago, echoed that sentiment. "I wouldn't say I was expecting it," Finkel said while attending a small vigil. "But I don't know that surprise is necessarily what I was feeling either." There have been scattered incidents of anti-Semitism in the area over the years that have occasionally drawn concern, including spray-painted swastikas. In 1986, a rabbinical student from Toronto visiting his in-laws was shot on the street in a killing many believed was motivated by the victim's appearance. He was bearded and wore a yarmulke with a long black coat, black suit and black hat — hallmarks of Orthodox Judaism. 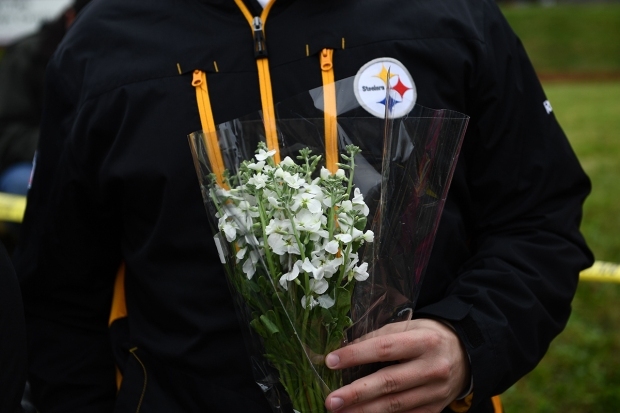 "This is a tragic event for everybody, and it's something that makes Pittsburgh strong," Pittsburgh Police Chief Scott Schubert said Sunday, a day after a gunman killed 11 people and wounded six others at the Tree of Life synagogue. As jarring and violent as that killing was, though, it came nowhere close to the impact of Saturday's attack. "It was unsettling, but somehow I don't recall that there was a sense that it was part of a larger phenomenon, that it was going to reflect a wave," said Barbara Burstin, a professor at the University of Pittsburgh who teaches about Judaism and has authored books including "Steel City Jews: A History of Pittsburgh and its Jewish Community." ''It didn't seem to be representative of a larger phenomenon, but now it definitely does." German Jews began arriving in Pittsburgh in the 1840s, followed later by Eastern European Jews. Tree of Life broke off from a reform congregation in 1865, moving to the Oakland neighborhood before building its current Squirrel Hill home after World War II. Today, some 20 synagogues are clustered in the leafy, well-kept area. Sarah Elbling Straus, a 41-year-old who grew up in Squirrel Hill, said she felt so secure in the neighborhood that she never experienced anti-Semitism until she left for college. She now lives in Gaithersburg, Maryland, and has been active in her new congregation, including on security issues. "You never think it would happen here," she said, "until it happens." AP National Writer Allen Breed contributed reporting.